The solar farm site is located at Sladevale, about 5km north of the Warwick town centre in the Southern Downs region of Queensland. The site is a 1 hour 45 minute drive from UQ’s St Lucia campus, and about 1 hour 20 minutes from the Gatton campus. The solar farm will total around 64 MWac and 78 MWdc. The project site is around 154 hectares, of which just under 30% will be covered by solar modules. The balance will be made up of the spacing between each row of panels, 16 inverter stations, access roads, screening vegetation to be planted, and several small buildings including a site office and a visitor/learning centre. The site meets a range of essential technical criteria such as proximity to a suitable substation, topography, aspect, geotechnical conditions and limited remnant vegetation. Importantly for UQ’s teaching, research, and engagement objectives, it is also close to the services and amenities of a major regional centre and to UQ campuses. UQ has a long track record of leadership in the deployment of renewable energy. Investigations into the feasibility of leveraging this experience to become 100% renewable began in early 2017. The business case for the initiative was endorsed by UQ Senate in October 2017. Agreement was reached with renewabled developer Terrain Solar in late December 2017 to purchase the project once construction was ready to commence. This purchase was completed in mid-November 2018, and UQ will now lead the construction and operations of the facility over its life. Land agreements have been finalised and Southern Downs Regional Council granted development approval in June 2018. The project’s Connection Agreements were finalised by Ergon Energy and the Australian Energy Market Operator in November 2018. Lendlease has been appointed the lead contractor for construction of the project, as well as to undertake maintenance for the first two years of operations. Following finalisation of the Connection Agreements for the project in November 2018, the detailed design and construction phase can now commence. This is expected to take 12 to 14 months, meaning the solar farm is expected to be complete and generating energy by early 2020. Construction work on site is expected to begin in early 2019. Further information on the timeline for the project's key milestones will be provided on this website when it becomes available. A budget of $125 million covers all project costs including acquisition of development rights, land purchase, construction, connection works, professional fees, and contingency. A loan from the Queensland Treasury Corporation will fund the majority of the project cost. A large portion of UQ’s former electricity spend will now go towards paying back the capital and operating costs of the solar farm. Terrain Solar led the site selection, land agreements, development approval, and connection agreement aspects of the project. Following completion of these milestones, UQ has now taken ownership of the project ready for the beginning of the construction phase. UQ intends to maintain full ownership and operational control over the expected 25-year life of the facility. What are the economic & employment benefits project? Construction of the solar farm is expected to create more than 100 direct jobs. Experience suggests that many of the construction jobs will be filled from within the local region, and UQ will be encouraging the use of local subcontractors and suppliers. Enquiries about potential employment or supplier opportunities should be directed to warwicksolarfarm@lendlease.com.au. Following construction, the site is expected to support around 6 operation and maintenance positions for the life of the solar farm. These include both skilled and unskilled positions. UQ will also be recruiting a facility manager to be based at the site full-time. The wider local economy is also expected to benefit from frequent visits to the site by members of the UQ community and other stakeholders. What other regional benefits and opportunities will the project create? UQ is excited about establishing a long term presence in the Southern Downs region and is actively working to identify and develop new opportunities from this development. To help facilitate this, UQ is proud to have recently signed a Memorandum of Understanding (MOU) with Southern Downs Regional Council. This MOU commits the parties to working together to help identify and deliver additional benefits for the region. These include things such as scholarships for local students, the establishment of visitor information facilities, and the potential to supply surplus power from the project at cost-price to power Council facilities and help put downwards pressure on operating costs for rate payers. UQ has also committed to installing electric vehicle chargers (including a 'fast charger') in the region. This Queensland-made technology can charge a car more than 20 times faster than a regular socket and has been successfully deployed at UQ’s St Lucia & Gatton campuses. This infrastructure will be free for the public to use, and will open up opportunities for electric vehicle travel and tourism in the Southern Downs region. How will agriculture and renewable energy be integrated? UQ is committed to agricultural co-production opportunities at the Warwick Solar Farm. The University has successfully piloted the integration of sheep within an operational solar farm at the Gatton Solar Research Facility and will seek to partner with local graziers interested in agistment within the solar array area at Warwick. Research into the integration of other potential agricultural activities at the site is also expected to be a focus area for UQ. integration of behind-the-meter demand response with in-front-of-meter large scale generation. Research opportunities will also extend beyond the engineering disciplines. For example, the project could be used as a case study to examine the economic benefits of renewable energy developments to regional Queensland, and how they can be maximised in future projects. What about future research opportunities? The Warwick Solar Farm will support the development of new and emerging research streams, particularly in fields such as energy storage. The generation profile of the solar farm will provide an ideal opportunity for piloting emerging battery energy storage or hydrogen conversion technologies. It also opens the possibility of working with pumped hydro or similar technologies for the ‘time shifting’ of energy on a large scale. These concepts are especially exciting from the perspective of developing collaborations with industry partners who wish to pilot and prove innovative new energy solutions. How will the project be used for teaching and learning? UQ will be able to leverage the Warwick Solar Farm for undergraduate and postgraduate students across a range of academic disciplines. Traditional learning experiences such as field trips will be used alongside innovative new methods. For example, live and historical data from the site could be used to develop realistic, web-based simulations and ‘games’ to teach topics such as energy markets. The solar farm’s educational benefits may also extend beyond UQ’s traditional student markets, forming the basis of specialist formal short courses or free online courses. Finally, the project will create a number of internship and work experience opportunities for UQ students, through both the construction and operation phases, across a range of disciplines such as engineering, occupational health and safety, and business/finance. What are the engagement opportunities for the project? The Warwick Solar Farm will become UQ’s flagship renewable energy asset. As such, it is expected to attract significant state, national and international interest. The site can expect to regularly host Australian and international delegations from academia, industry and government. Engagement with primary and high schools will also be a key focus area. Over 500 students per year participate in hands-on ‘introduction to solar’ programs at the St Lucia campus, and this is likely to be expanded to schools in the Southern Downs region once the Warwick Solar Farm is completed. How can the local community stay up-to-date with progress? This website will be updated regularly with more information on the project, including the timeline for key milestones, as it becomes available. More information on the broader proejct can also be obtained by contacting warwicksolar@uq.edu.au. Please note that enquiries regarding potential employment or supplier opportunities should be directed to warwicksolarfarm@lendlease.com.au. Will I be able to visit the solar farm once it’s completed? Absolutely. UQ will have a full-time staff presence on site, and intends to organise regular tours for interested members of the public. Further information will be available as construction nears completion. How will the project connect to the grid? Existing Ergon Energy network power lines will be extended to connect the Warwick Solar Farm to the network. Ergon-approved contractors will design and build the extension, and Ergon will ultimately own these lines. While the exact design for the extensions is still to be finalised, it is anticipated that existing road reserves will be used and no new easements will be needed. Permits or approvals required for the works will be arranged by the contractor in consultation with Ergon Energy. The final design of the power line extensions is required to be approved by Ergon Energy in accordance with their technical standards and guidelines set by independent regulating authorities. Any appliance with electric current flowing through it creates electric and magnetic fields (EMFs) – including personal computers, hairdryers, electric blankets - and power lines. Independent regulating authorities set exposure limits for EMFs, based on peer-reviewed research and technical modelling. Preliminary modelling indicates the power lines associated with the project will have a peak magnetic field of around 6 milliGauss – or 0.6 microtesla (µT). This compares to the international guideline limits for public exposure of 2,000 milliGauss (200 µT). Personal computers have been measured to produce around 5 milliGauss (0.5 µT). The overall average magnetic field from the power lines is expected to be significantly lower than 6 milliGauss, because the solar farm will only generate power during daylight hours. UQ has signed a Memorandum of Understanding (MOU) with Southern Downs Regional Council. The MOU is a commitment from both parties to work together to help identify and deliver additional benefits for the region. 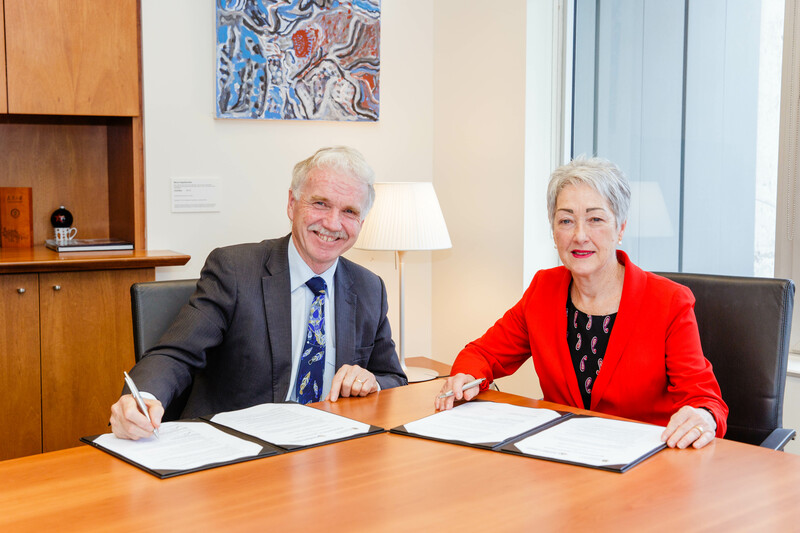 The non-binding MOU was signed by UQ acting Vice-Chancellor Professor Aidan Byrne and Southern Downs Mayor Tracy Dobie on 14 June 2018. Opportunities being considered include scholarships for local students, the establishment of visitor information facilities at the solar farm, and the potential to supply surplus power from the project at cost-price to power Council facilities and help put downwards pressure on operating costs for rate payers. UQ has also committed to installing several electric vehicle ‘fast chargers’ either at or near the solar farm site.